Given a rectangular selection, this plugin will use the borders of that selection to fill the contents to allow you to delete the contents and replace it with appropriate pixels. 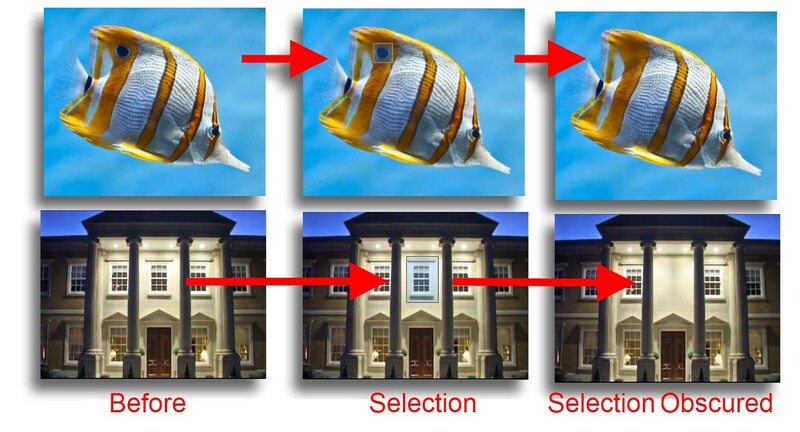 This is helpful in removing items from images so the eye doesn't notice an obvious seem. There is an option for an interesting center which applies some pattern internally so it's not just a simple blend. You can also tweak the sharpness of the blend, the sharper the value the more the edges match correctly but may see visible artifacts in the center, the blurrier means a smoother center but may highlight disjoints around the edges. This plugin does rotation on the selected area. A great advantage is this rotation plugin operates around the center of your selection as compared to Paint.NET's rotation plugin which always uses the center of your whole image. Here's a Vignette plugin I've made using CodeLab's C# tool. The effect is added to the Effects/Artistic menu option. Like the vignette one too. Would save a lot of time when making some of my sigs. Thanks a lot man! For any iPhone app makers out there you may have found making icons a bit tricky with Paint.NET. The magic is you need to use only the alpha channel, as the RGB is discarded by the iPhone and save the image as a 32bit PNG. This plugin will sample the luminosity of your image (RGB value) and convert it into a greyscale (or you can author it in greyscale if you'd prefer). It will then set the greyscale into the alpha channel and set a user selected RGB value so you can visually see the icon in editors. Transparent areas will be transparent on the iPhone (i.e. showing the tab bar). Opaque areas will show up as light colours. Icons need to be about 20 pixels high and no larger than say 40 pixels wide. Here's an image of it in action (using an image that is much larger than 20 pixels high so would need to be downsampled). One suggestion: Put everything in the first post and possibly in the same ZIP so that they're easier to find, especially if you release a new plugin after a lot of comments. This was done to help test tinting for fullscreen effects in movies and games. It will add the menu option to Effects/Colour/RGB_Remapper. Effectively it runs the RGB value through a matrix to remap to other colours so you can convert your Red's to say Yellow but leave Green and Blue channels uneffected. The alpha channel is untouched. To use the orthogonal matrix just set the Red value to Red, Green value to Green and Blue value to Blue... this should produce exactly the same image that you see to begin with. From there you can start tweaking the colours to remap the RGB channels to other colours. Very handy for swapping the Blue and Red channels around for instance but equally very helpful for matching skin tones from different lighting conditions or media. 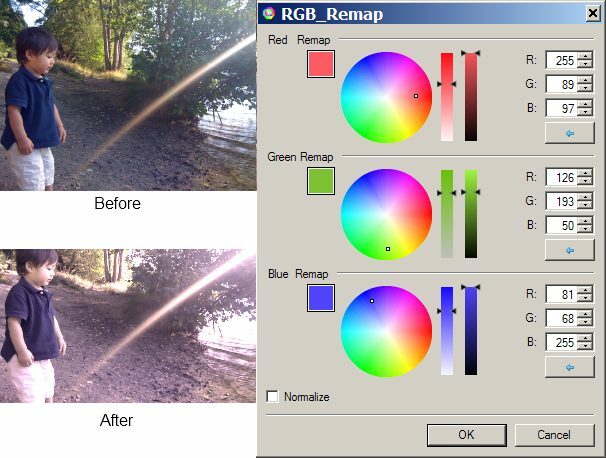 There is a normalize option enabled by default (check box), disabling this means you'll get a non-normalized matrix so you can do things which aren't technically accurate but give good effects like replace the red and blue channels with say dark grey so you'll only have shades of grey and green in your image (used heavily in films like Matrix). This will be useful. Thanks! Looks very interesting. I'll give them a try. Thanks ! Here's another very simple but somewhat handy plugin. I've coined it 'Alpha Contrast', it can really help get a good sharp edges after gaussian blurring something with alpha in. What it does is a value of 100% leaves the picture untouched. A value of 0% will make everything have 50% transparency. A value of 100% will leave the alpha in the picture untouched. A value of 200% will make any source alpha at 50% remain at 50%, src alpha at 25% will become 0% and src alpha at 75% will become 100% opaque. Attached is a zip will all the plugins so far. I use Advanced Rotate fairly often, but I have a question: Did the author make 45 the default as a joke? It is irritating and I cannot understand why the default can't be zero or 1. 45 is ridiculous! It had to be something! The CodeLab source is part of the download package. Download and install CodeLab as you would any other Effect then fire up paint.net. Open CodeLab (paint.net > Effects > Advanced > CodeLab) and load the Advanced Rotate source file (AdvancedRotate.cs). Modify as required and save the source file before building it as a DLL. At the time the plugin was written, CodeLab plugins couldn't modify the default value of 45°. If you follow my previous directions you can rebuild the source file to create your own custom setting. Thanks - I hadn't seen that. I have it downloaded and will give it a try. Thanks! UPDATE: Fixed it. Thanks, much! There are six now I've added SelectionObscure.dll to the zip file. Try downloading it again. @Ego Eram Reputo, I think that PDN is suppressing SelectionObscure.dll. I couldn't find it anywhere in the Effect submenu. I couldn't find it anywhere in the Effect submenu. I could have swore it didn't show up. Ah, all is well now.